This is really the easiest thing you’ll do all day - promise! 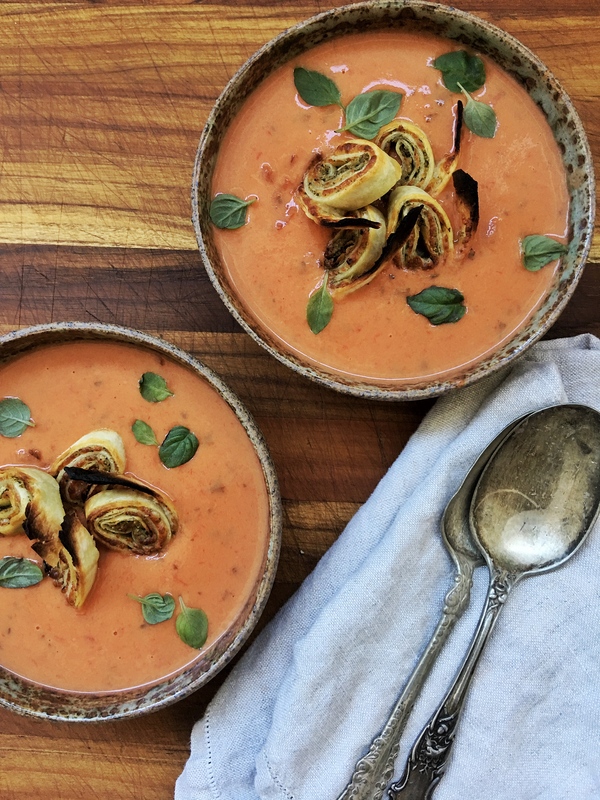 We started with a base of Progresso Hearty Tomato Soup, to which we added just a touch of cream (read: luxuriousness), and some really fun Pesto Cheese Tortilla Pinwheels. I dare you to try to not eat all of them before they go onto the soup. In a small saucepan, bring soup to a simmer - slowly add cream and stir to combine. Remove from heat and cover. While soup is coming to a simmer, spread pesto onto Burrito Shell and cover with cheese. Sprinkle crushed red pepper flakes over cheese. Place under broiler for 60-90 seconds, keeping very close eye on it, as it will brown quickly. Remove from oven once cheese starts to melt. Transfer to a cutting board and roll, tightly. Slice into ¼ inch slices and place back on cookie sheet, cut side down. Return to broiler for about 60-90 seconds until deep golden and crunch.